The gold quarter eagle, worth $2.50 face value, was authorized by the Mint Act of April 2, 1792, although the first coins of this denomination did not appear until 1796. In a bit of an odd twist, nowhere on the coin is the face value denoted. 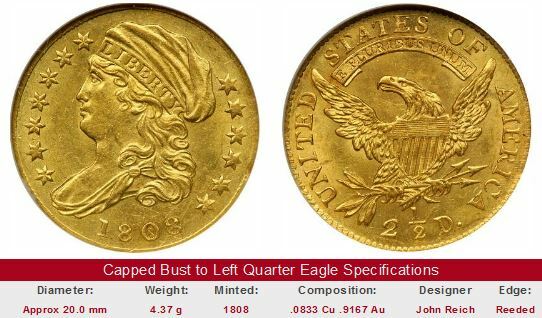 The first gold quarter eagle was the Capped Bust to Right type of 1796-1807. The obverse shows Liberty wearing a head turban fashionable with women of the late 18th century. For a long time, the turban was incorrectly thought by many to be a liberty cap derived from ancient Rome, as was the case with other United States coinage. Research later uncovered the 1825 writings of Mint Director Samuel Moore, who verified the true nature of Liberty’s head attire. For this reason, numismatists also call this the Turban Head type. An example is seen directly below. 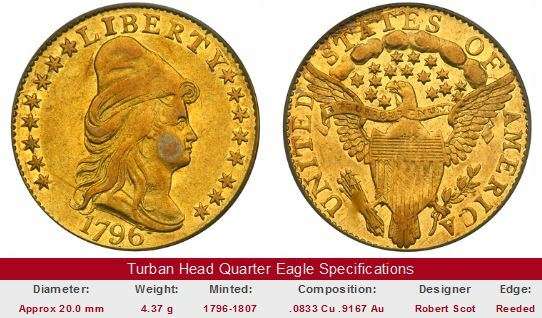 Less than 20,000 Turban Head Quarter Eagles were minted. Tensions between the U.S. and Europe throughout the 1790s and early 1800s drove European gold prices higher. Bullion dealers exploited this situation by obtaining American gold coinage in exchange for relatively cheap Mexican silver and exporting it to overseas melting pots at a considerable profit. The risk of immediate doom greatly curtailed production of all U.S. gold coins during the earliest years under the Constitution. The Mint hired John Reich as Assistant Engraver in 1807. Reich was a highly reputed German die sinker who arrived in the United States as an indentured servant in 1801. After six years of failing to secure permanent employment at the Mint because of internal politics (apparently, no one wanted to offend the sensibilities of Chief Engraver Robert Scot), Reich began making plans to return to Germany. Through the intervention of President Thomas Jefferson, the assistant’s position was created for Reich to retain his talent. 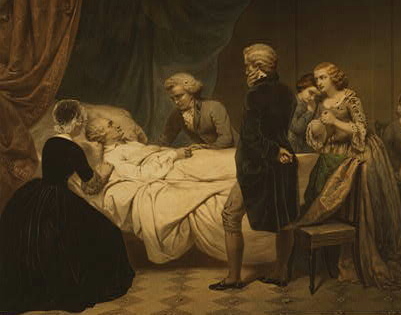 The death of George Washington occurred on Dec 14, 1799. On the evening of the 13th, he suddenly developed difficulty in breathing, and in less than 24 hours, he was gone. His last words were "'tis well". Washington was the foremost political figure of his time, leading the Americans to victory in the Revolutionary War, oversaw the drafting of the US Constitution, and served two terms as the first president of the new nation. As fate would have it, Washington was a man for his time only, bidding farewell just 17 days shy of the dawn of the 19th century. Reich immediately set out to upgrade the appearance of United States coinage, including a new gold quarter eagle, released in 1808. Reich depicted Miss Liberty facing left, wearing a mobcap decorated with the word LIBERTY. The Capped Bust to Left, sometimes known as the Capped Draped type, featured a somewhat realistic eagle extending its wings sitting atop an olive branch, while holding arrows suggesting force, if necessary, to defend itself. Reich’s eagle reverse would remain a fixture on U.S. coinage for the next 100 years. The Capped Bust to Left Quarter Eagle was in production for the year 1808 only. A single set of 1808 dies were made, and numismatists theorize it broke after only 2710 pieces were made. Thereafter, quarter eagle gold coinage was suspended due to the continued threat posed by international bullion dealers. Quarter eagle production resumed in 1821. Although gold coinage still had trouble remaining in circulation because of its high intrinsic metal value, several banks deposited gold bullion from Mexico and requested quarter eagles in return under the Mint’s “Free Coinage” policy. Reich resigned from the Mint in 1817 in disgust over his stagnated salary of $50/month, so the duty of resurrecting the quarter eagle fell to Robert Scot. Scot’s Capped Head to Left type was nothing more than a slightly modified version of Reich’s 1808 design. At age 77 and with failing eyesight, Scot was probably not up to the task of originating a new design from scratch. The most noticeable difference was a 1.5 mm (.059 inches) decrease in diameter. The weight remained consistent, so the 1821 quarter eagle edition was thicker than its predecessors. In 1829, the diameter was reduced by another .3 mm. The Capped Head to Left was minted in small numbers nearly every year until 1834, but never gained a foothold in American society because its gold content was worth more than its face value, making it subject to exportation and melting. 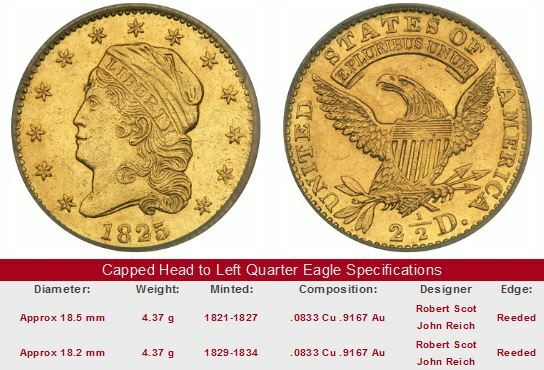 The gold quarter eagle types of 1796-1834 are often referred to as Early Quarter Eagles. Even in their time, they were considered quite rare. By today’s standards, an Early Quarter Eagle is truly one of the greatest prizes a collector can ever hope to attain. Any genuine example put up for sale will attract attention, but only lookers with lots of cash can make a serious bid. Based on past value trends, new buyers of these incredible coins have every reason to expect a good return on their outlay, should they decide to sell in a few years. Of special interest is the 1808 date. It is considered a type unto itself, because its diameter is larger than other Capped Head Quarter Eagles. Only about 50 examples are known to exist, all subject to unrelenting pressure from collectors. The 1808 Quarter Eagle is one of the most significant coins in all of American numismatics. An MS-63 (PCGS) gem sold for $517,500 in November 2008. It is strongly recommended to buy Early Quarter Eagles that have been certified by one of the four leading grading service companies: PCGS, NGC, ICG, or ANACS. If not, then the seller had better be someone trustworthy. These rarities have been frequent targets of counterfeiters for a long time. Grading is critical too, since a one or two point swindle on the 70 point grading scale can cost you thousands, so be careful who you're dealing with. The links below take you to pre-selected eBay gold coin auctions. The link on the right hand side of the first box is coded to bring up all auctions for Turban Head Quarter Eagles. The 1796 "No Stars" historic value trends are shown on the left hand side to represent the type. The second box represents the Capped Draped type of 1808. There is a link to eBay, but a genuine specimen is very unlikely to come up for sale, but it's still fascinating to study the skyrocket record of this incredibly rare gold coin. Finally, the third box locates all Capped Head to Left Quarter Eagles, with the 1826 highlighted to speak for the group.